Funeral services for Joanne Grancer were Monday, April 8, 2019, at Pelan Funeral Services in Tekamah, Neb. Burail was later in the day Monday at Mt. Vernon Cemetery in Peru, Neb. 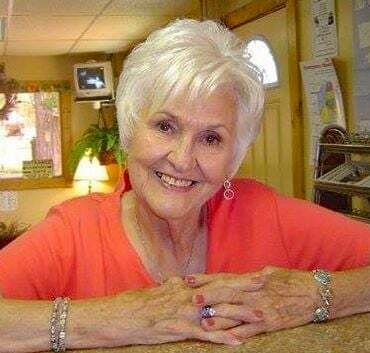 She passed away April 4, 2019, at Josie Harper Hospice House in Omaha. Joanne Kay (Brock) Grancer was born to Mose and Ella (Manzer) Weston on March 28, 1933, in Omaha. At the age of 12, Joanne was adopted by Eugene and Mildred (Hazen) Brock from Tecumseh, Neb. Her two younger sisters, Joyce and Janet, were also adopted at the same time, but she had two brothers, Jack and Jerry, who were separated from the girls. Joanne was very active in school activities such as cheerleading, softball, band, drama club and show choir. She graduated from Tecumseh High School in 1953 and attended Peru State College, where she obtained her teaching certificate. On Dec. 13, 1953, she married Jerry Jack Grancer in Tecumseh, and they had four children. In addition to being a loyal football coach’s wife, she worked as a teacher, diet center owner, activity director and restaurant cook. Her biggest passions in life were family, Husker football, cooking, her beloved dogs and spending time with longtime friends. She was preceded in death by her husband, Jerry Grancer; parents, Eugene and Mildred Brock; birth parents, Mose and Ella Weston, sister-in-law, Marilyn (Grancer) Lafferty, father-in-law and mother-in-law, Jack and Madeline Grancer; great-grandson, Max Sears; great-granddaughter, Cali Hesser. She is survived by her sisters, Joyce (Harry) Boss and Janet Goers both of Lincoln, Neb. ; daughters, Jill Grancer of Texas, Jody (Dave McMillan) Grancer of Omaha, Jacque (John) McKeown of Lincoln; son, Jerry Jay (Debbie) Grancer of Omaha; 12 grandchildren; 21 great-grandchildren; nieces and nephews.